Pyay Khaing is a Myanmar Entrepreneur, an International Speaker, writer, Peak Performance Trainer and public figure. 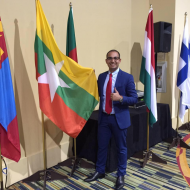 He was born in Myanmar and enjoys helping others to make life-transformational changes. He provides training and coaching services to the public, companies, and individuals. Since 2010 he has conducted training in Australia, Singapore, Malaysia, Indonesia, Vietnam and Myanmar. He is known as Tony Robbins of Myanmar. He was working with world renown Speakers, Trainers, Leader like Tony Robbins, Sir Richard Branson, Dr. John C. Maxwell, Robert Kiyosaki, T Harv Eker, Blair Singer, Steve Wozniak (Apple Co-Founder). He started his IT Network Consulting career in Singapore back in 2008. Then he moved into training career in 2010. He has worked for MNCs like IBM, DBS Bank and HP as a Senior Consultant. He became 1st and only NLP Trainer from Myanmar in 2016. It was approved by American Board of NLP (ABNLP). He is also the first and only TetraMap Facilitator from Myanmar. He is also a certified Trainer and Coach from John Maxwell Team, one of the biggest Leadership organization in the world. and corporate organizations to realize and achieve their greatest potential. Living by the mission “Empowering LIVES Every Day”, with his team, he has touched the lives of more than 7000 individuals and many organizations through his unique range of inspirational and dynamic Neuro-Linguistic Programming (NLP) based programs on Personal Development for Students and Youth (Every Child is Special), Personal Mastery (Breakthrough to SUCCESS), Financial Management & Investment (Wealth Mastery), Leadership Programs, Sales & Customer Service, Business Strategic Planning, Corporate Training, Team Building and many more. He is currently the CEO, Founder and Master Trainer of Myanmar Excellence Institute – MEI.